When I was in Italy on those sunny, balmy days in May I enjoyed one of the happiest meals I've ever had. It was simple but sublime: Caprese Salad with crusty Italian bread and Pelligrino with lime enjoyed while sitting outdoors at a cafe staring out at the Mediterranean. The ingredients were simple, rustic and pure. It was heaven. Earlier this week at the farmer's market I discovered these beautiful deep red small tomatoes no bigger than 2 inches across (bigger than a cherry tomato and smaller than a typical tomato.) As I looked at the tomatoes, the groovy guy working the farm stand handed me a tomato to try. I did and it was POPPITY POP POP-- the taste of summer. I bough the tomatoes and I knew that however I used these had to showcase the simple, clean flavor of these locally grown organic fruits. Caprese Salad can be served many ways. You often see it laid out on a plate with vinegar and olive oil drizzled over the top. However, several months ago I found these small dipping sauce bowls/plates and I knew this would be a fun way to serve the salad. 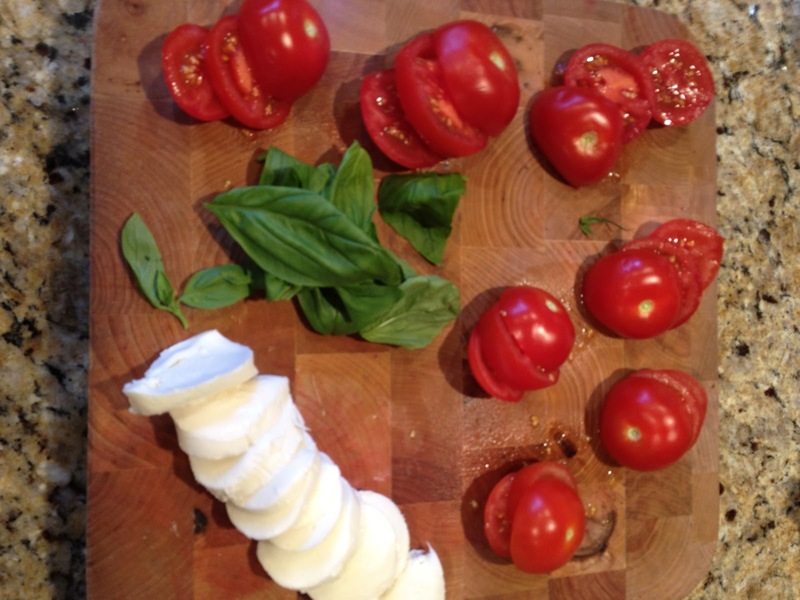 Here is how to make Caprese Salad. 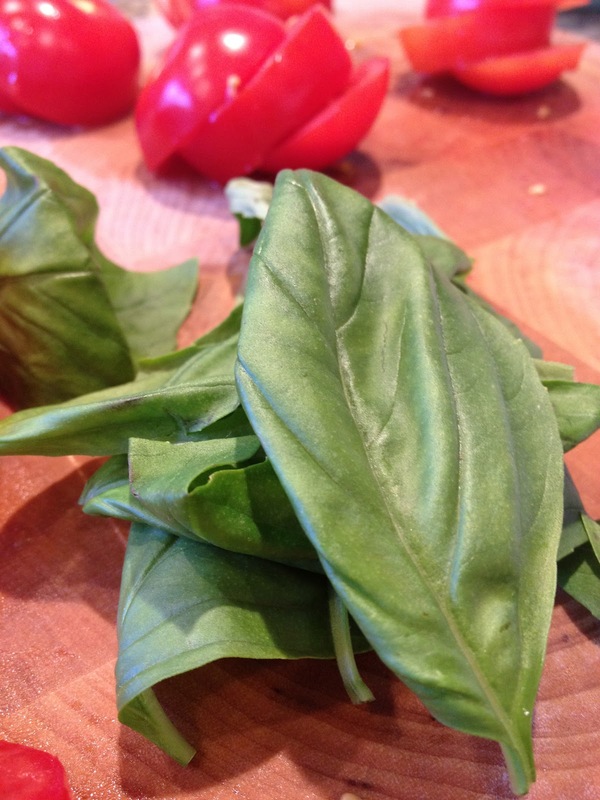 Each serving of Caprese Salad serving requires 1 tomato, 1 Mozzarella ball and two Basil leaves. Wash, rinse and dry tomato. Slice tomato horizontally into three sections. Put aside. Scoop Mozzarella ball from water, pat dry and slice into three sections. Put aside. Rinse Basil leaves and put aside. In a small bowl begin to assemble the Caprese Salad stack with the tomato bottom followed by a slice of Mozzarella and a basil leave. Follow with another slice of tomato, Mozzarella and basil leaf. Top with top of tomato. Combine 3 tablespoon of olive oil and 1 tablespoon of vinegar in a small bowl and whisk until combined. (This will be enough for four servings of Caprese Salad.) Drizzle one tablespoon of vinegar and olive oil mixture on tomato followed by a sprinkling of salt and pepper. Serve with crusty Italian bread and wine or Pelligrino for a light summer meal. The tomato stack is slippery and will topple over if not in a small bowl that just fits the tomato. To keep the stacked salad, insert half a bamboo stick (typically used for barbecue skewers) into the middle of the upright stack. You can also serve this salad kebab-like by sliding each ingredient into a skewer. 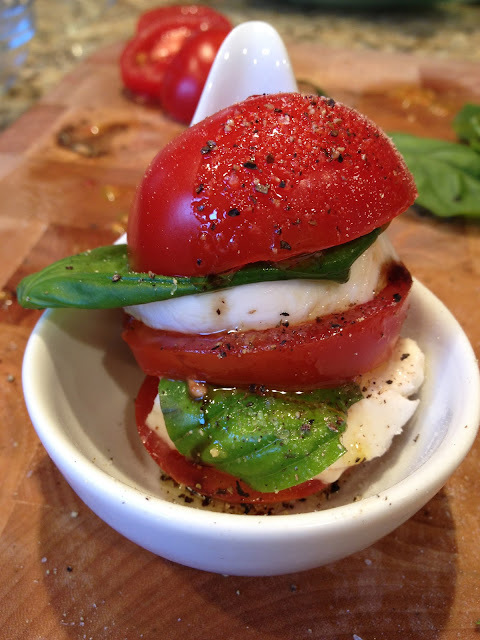 If you have large tomatoes you can also make this, just buy the larger Mozzarella balls and stack the same way or serve sliced on a serving plate, still using the tomato/Mozzarella/Basil method.